She stands at waters edge, leaning into the cool morning air…waiting for him to return. 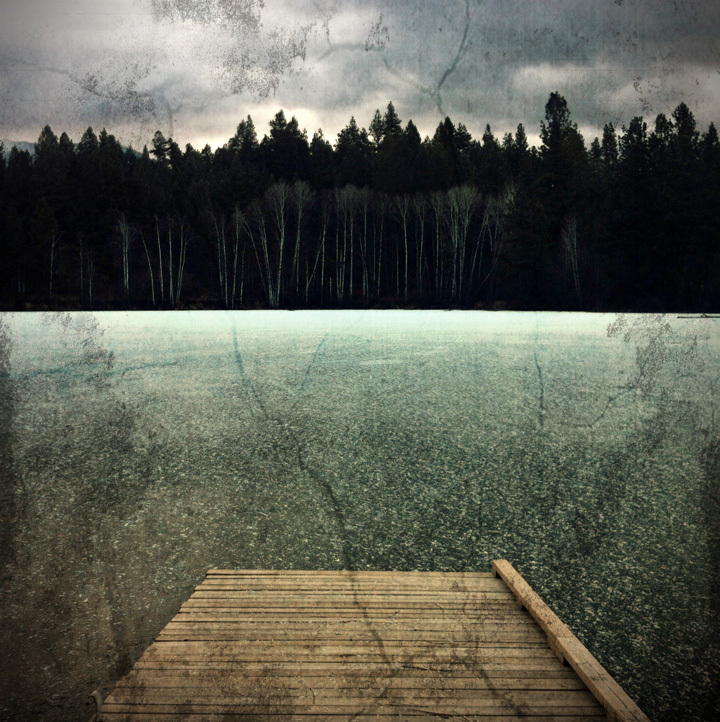 Stepping onto the dock and into the sun, she can hear water lapping and birds in the trees across the lake, their calls echoing over the still water. Snapping turtles rest on a partially submerged log, wary of passing boats and the bullfrog croaks loudly from some reeds to her left and she wonders if they really do taste like chicken like she’d heard. The smell of burning Alder wood hangs in the air and reminds her of, those days. He wades back into her thoughts. Hands pressed to her lips, then open palms towards winters lake. Solid grounds not so solid. A false sense of safety gives rise to beliefs and expectations not supported. This unwanted transformation is, just maybe……………… exactly what you need. The latte tastes rich, hot over tongue and beyond. Warming my insides and letting the feeling grow. The foam is light and was adorned with a leaf, which looked great till my spoon dumped a teaspoon of sugar onto it taking it to the bottom of the cup. I sipped gently, listening to the chatter around me and the jazz playing over the speakers. I wait in anticipation. A few more sips, cooling as I go. Finally I savour the last of it and I’m saddened to discover that the leaf is not where I hoped it to be. I’ve been doing this for some time and sat at my local cafe this morning and decided to write one and share it. For those not familiar, stream of consciousness writing is simply beginning to write and not stopping. Whatever flows into your head, you write. Some are short, and some are very long. I started doing this after reading Julia Cameron’s – The Artists Way. The coffee shop clatters of cups and saucer, spoon and mug and the never ending chatter of hopped up patrons that blend into a sea of sound like no other. Babbling brook, water flows over bedrock and pebbles that form bubbles that collect in murky eddies constantly being replaced by new as old bubbles pop, which was not the intent of the bubble. What am I talking about? Small conversations in my head as I write. Can’t stop, those are the rules. Free flow. Like the brook, or the stream, thoughts rain out and run downhill towards some book and pen, like a lake or ocean that collects the rain from days or weeks past. Thoughts gather in murky eddies while others flow. These stuck thoughts don’t pop like the bubble which was their intent all along.